My best work of the night. Alastor's hair was colored by Lin, but I drew and colored the rest of them. This is his new happier hair color from after he left Abysus. 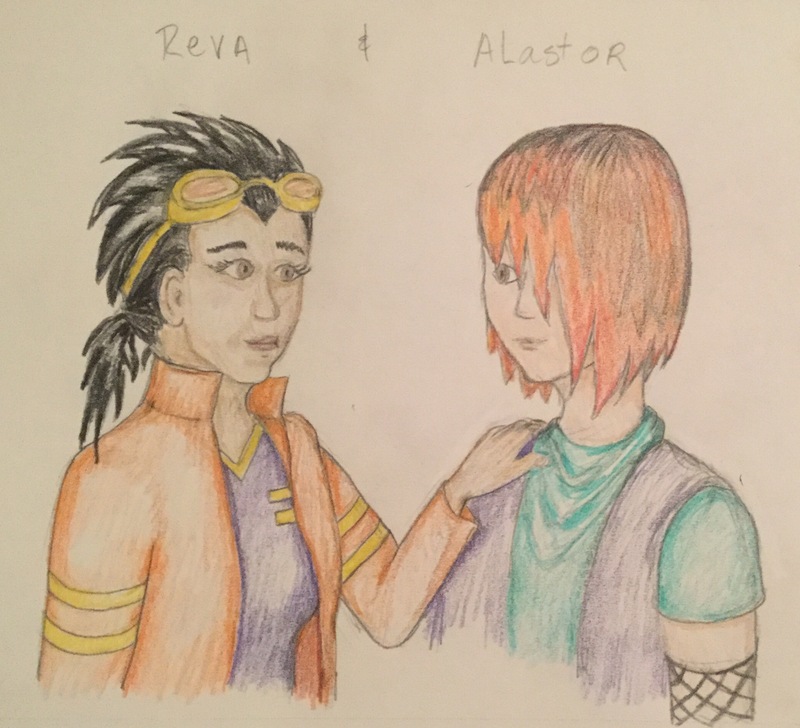 PS...I know Reva almost looks like a guy in this [her face is not very feminine] and Alastor looks like a girl. since I drew It for Lin and Lin knew who they were and didn't care if he looked a bit too feminine, it doesn't matter. and actually gender isn't really even relevant to the scene, the point was that his power doesn't make her uncomfortable, so they can be friends. Whether they are ever more than friends remains to be seen. Reva look like rule 63 of Rex Salazar. Alastor was the boy version of Rex's girlfriend Circe, but since I did most of the creation on him he doesn't look identical. plus he has different powers, instead of screaming at evos he makes other people angry, and he's not a twin, he's older. what's rule 63? I've never heard of that. She's like Lin's way of making an OC out of a male main char she loves... give it a girl body, longer hair and eyelashes, and the most similar female name you can find...lol.